All students are placed into one of four houses: Godiva (Blue), Webb Ellis (Yellow) Shakespeare (Purple) or Whittle (Red). The aim of the house system is to create the best possible ethos for students’ personal and social development and for the achievement of their potential in all aspects of college life. This is achieved through encouraging all students to take part in house activities and to give a sense of belonging and participation, whilst at the same time helping others less fortunate than themselves. Older students are encouraged to play a nurturing role to create a family atmosphere. Students also have the opportunity to represent their house and tutor group by being elected onto the Year Council. If they flourish at this, they can stand for Year President and sit on the full College Council chaired by the Head Boy and Head Girl. The four houses compete with each other to win the annual house competition, the winning house being the one with the most points at the end of the Summer Term. Students in the winning house have the opportunity of taking part in a house trip in October. Students can gain House Achievement Points in a number of ways including effort in lessons, sport, charity events, reading competition, full attendance, examination results, various department competitions, etc. Students can also gain house points if their uniform is consistently worn correctly. The efforts of individual students and groups of students in each house are recognised in an awards ceremony at the end of the Summer Term. Students can gain certificates, vouchers and recreation time within school to reward their achievements within the house system. Students in sixth form can gain 25 HAPs per term for their paired reading and peer mentoring. I am extremely happy to be the head of house of such a successful, happy and supportive House. Since taking over Godiva the house has been extremely competitive in the house competition. The reason Godiva is successful is due to the commitment the students have to the house and the high levels of participation. This year would not have been as successful without the students participating in all of the house competitions that we offer. A fantastic start to the year with 325 Godiva students attending the House trip to Thorpe Park! Exceptional behaviour from all students meant that all students and staff had an extremely enjoyable day. This term we must our energy on HAPs; continue our participation in House competitions and House Sport; continue to work hard in lessons and aiming to be your subject teacher’s ‘Student of the Month’. Remember, HAPs mean prizes! Keep your eyes peeled for up and coming competitions you’d like to be involved with, equally, if you feel that there’s one that we’ve missed. Please feel free to submit your suggestions to the House Captains or me in the Girls PE office. I am extremely excited to announce the new Godiva House Captains. We have a team of students who will hopefully help lead Godiva to victory once more. Well done to Alex Ibbs and Frankie Hadley on becoming House Captains and Emily Storer and Shimra Ahmed on becoming Vice Captains. Go Go GODIVA! 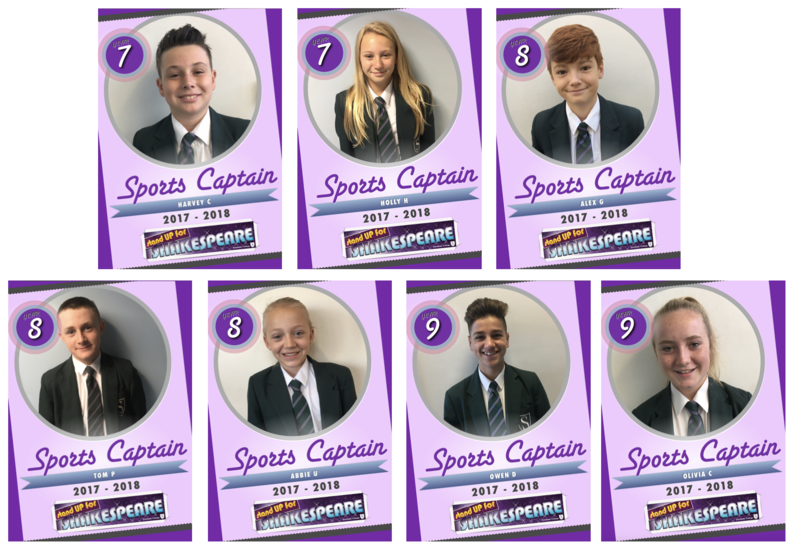 I am pleased to announce the new Godiva Sports Captains for 2017/2018. For year 7 we have Madeleine J and Reni Bwho have already shown fantasticsporting ability in the house cross country and their organisation skills in arranging a great team. Harry D has continued with his role as sports captain role this year but is being helped by Lucy P to help motivate the year 8 students this year to victory. The successful year 9 sports captains from last year Poppy L and Charlie Pare continuing their fantastic jobs with the support of Harley W who is the new addition to the year 9 team. I have full confidence that all 7 of these will do a fantastic job and will help lead Godiva to victory once more! William Shakespeare was an English playwright, poet and actor and regarded as the greatest writer in the English language...Shakespeare house is about creating memorable experiences and opportunities for those to become the best that they can be. I am so excited to represent Shakespeare as your head of house and as part of that role along with the other heads of house we have a clear vision to promote values in line with the ethos of Southam College: high expectations to be the best you can be, supporting one another around school, providing opportunities for you to be the person you aspire to be and giving independence to take on responsibility and thrive in your learning environment. As part of Shakespeare you will experience a wealth of competition, oppportunity and togetherness. I am a strong believer in working as a team to bring about success and am whole heartedly committed to providing support and encouragement to the house and everyone in it to achieve our goals. I want Shakespeare students to be proud of the house they represent, to contribute to competitions and to feel like part of a community that achieves together. It is a known fact that winning isn't easy and that is why a strong, supportive house that comes together is the best strategy. Throughout the year Shakespeare students can participate in a wide range of house competitions tailored to meet the needs and challenges of each individual student. For entering and taking part in competitions HAPs can be won. The main way to win HAPs for your house is through good behaviour in lessons, helpfulness, progress, outstanding home learning and many more ways! Keep your eyes peeled for house competitions on our house board and through the website! Let's make the next year a huge success!! 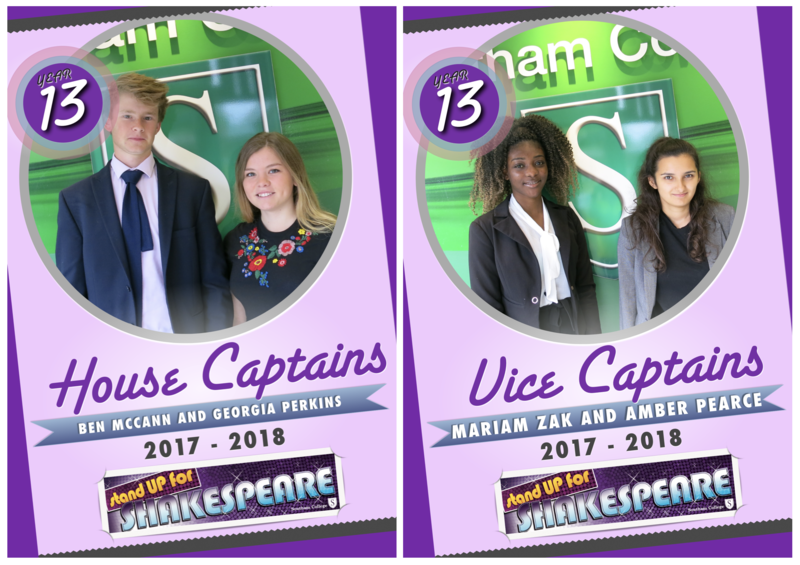 Congratulations to Georgia Perkins, Ben McCann, Amber Pearce and Mariam Zak for successfully becoming the Shakespeare House Captains! I am hoping that they will help to bring Shakespeare the win!! SHOUT FOR SHAKESPEARE!! A big congratulations to Holly H, Harvey C, Alex G, Tom P, Abbie U, Olivia C and Owen D who are this years Sports Captains for Shakespeare! I'm looking forward to a successful year of sport with your support and enthusiasm! Webb Ellis is one of Southam College’s four houses, named after William Webb Ellis the inventor of the very popular sport Rugby. I am very excited and proud to have the role of Head of house for Webb Ellis. As part of that role along with the other heads of house we have a clear vision to promote values in line with the ethos of Southam College: high expectations to be the best you can be, supporting one another around school, providing opportunities for you to be the person you aspire to be. Throughout the year Webb Ellis students can participate in a wide range of house competitions. For entering and taking part in competitions HAPs can be won. The main way to win HAPs for your house is through good behaviour in lessons, helpfulness, progress, outstanding home learning and many more ways! I want Webb Ellis students to be proud of the house they represent, to contribute to competitions and to feel like part of a community that achieves together. Stay motivated and immerse yourself in activities across the school where you can! Keep your eyes and ears open for upcoming competitions you’d like to be involved with, equally, if you feel that there’s one that we’ve missed. Please feel free to submit your suggestions to the House Captains or me in the maths office. Let’s make this year just as successful as last year! 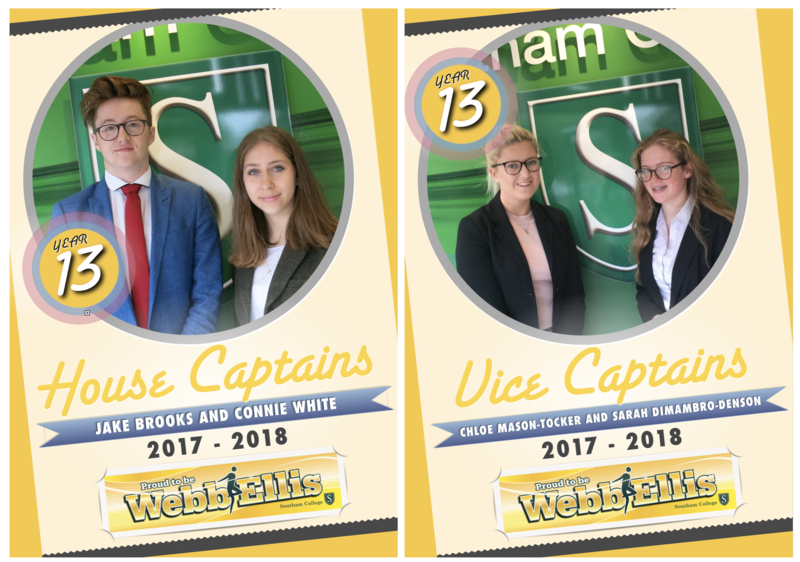 We are excited to announce our new Year 13 Webb Ellis House Captains for 2017-2018. Our HouseCaptains are Connie White and Jake Brooks. Our Vice Captains are Chloe Mason-Tocker and Sarah Dimambro-Denson. I look forward to working alongside all of our Captains; I know these students will be excellent role models and will do their best to engage with the younger year groups. 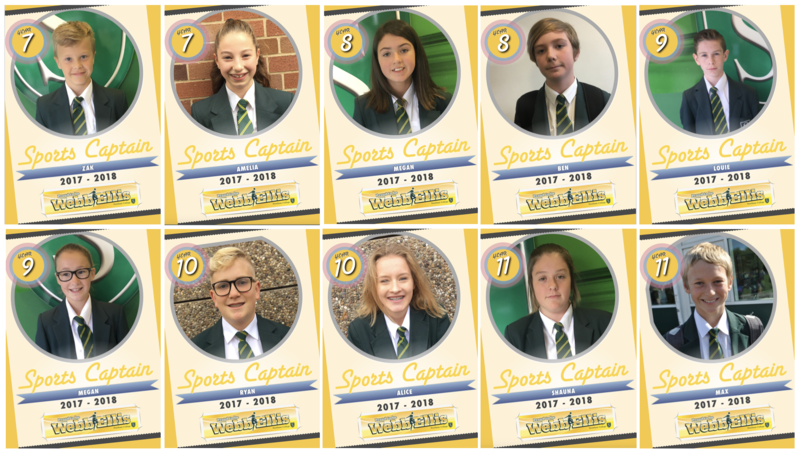 We are excited to announce our Sports Captains for 2017-2018. Our new Year 7 Captains are Zak Benson and Amelia Blumberger. Well done for your great interview and applications for the role. We are excited to welcome Megan Free in year 8 to for the girls Sports captain role, alongside Ben Kay who has decided to continue his role again this year for the year 8 boys. For year 9, we are pleased that Louie Bulyka and Megan Hughes still wish to continue as they have been fantastic over the last few years. For year 10, we look forward to another year with Alice Parsons for the girls and we welcome Ryan Alexander who is our new year 10 captain for the boys. For year 11, we are very pleased that Max Hurtubise and Shauna O'Neill still wish to continue with their captain roles. I know these students will be excellent role models and will do their best to engage with all students within the House. Whittle is one of the four houses within Southam College, named after Sir Frank Whittle, inventor of the jet engine. Our House colour is red and Miss Lippert is the Head of House. After coming fourth last year, I am keen to prove that we can work together as a house and show the students that Whittle really are the best! Whittle students are renowned for their excellent participation and willingness to go above and beyond what is expected of them. I am so proud of all the students who partake in the wide range of house activities that Southam College has to offer and it is always so fantastic to see the enthusiasm that Whittle students have when comes to completing them. Our great Sixth Form House Captains for the academic year 2017-2018 are Megan Hickey and Jack Walker with our Vice Captains being Suzannah Brooks and David Simmons. All of whom are going to help maximise the potential of our house and help to pull us from the bottom of the ranks and shoot to the top! Throughout the year Whittle students can participate in a wide range of activities such as sport competitions, reading challenges, departmental based competitions and other clubs to earn house achievement points called HAPS. The main way to collect HAPS is through outstanding effort, behaviour and work in lessons. Whittle students can also earn HAPS through being polite and helpful towards staff members. Remember participation is key and we cannot win overall, without working together to begin with! Lets turn this year around and progress towards winning the house cup! Huge congratulations to our house captains and vice captains for the academic year 2017-2018. I am really excited to announce that our captains for this year will be Megan Hickey and Jack Walker, whilst our vice captains are Suzannah Brooks and David Simmons. All four have impressed me with their ideas and organisation skills and are going to be vital in helping Whittle secure the cup this year! Huge congratulations to the new Whittle Sports Captains for 2017-2018, I was really impressed with your organisation and motivational skills that you displayed in your applications and I am looking forward to working with you all. Our new Year 7 team is Josko and Rosie, in Year 8 we have Nel and Jack and finally in Year 9 Alex and Ted. We are going to make this our best House Sport season yet! Well done to all of the students who took part in this years House Cross Country! Some outstanding performances from all year groups: Abbey Griffiths-Standage came 1st in the year 7 girls with a time of 5 minutes 51 seconds, closely followed by Scarlett Sanders with 5 minutes 55 seconds! Read more about Well done to all of the students who took part in this years House Cross Country! We would like Year 7 Year 8 and Year 9 students to design a poster about another European country they would like to visit. Design a poster about Safety in Science. This is an opportunity to encourage students to think about the importance of kindness, tolerance and international understanding. It also gives students an outlet for artistic self expression that can be shared with their local community and possibly the world. Well done to all of the House T-Shirt Competition entries. We had an amazing amount of entries from a range of year groups and houses and have been extremely impressed with the standard and variety of photos! Create a story board for a 30 second TV advert for your new summer fruit Smoothie product. he Eurovision song contest will take place on the 12th May and we want us all to get involved so that we can celebrate languages through music. To be in with a chance of winning a free book from Usborne publishers simply create a picture collage of what you have been reading in the last month. 24 Hour Football event coming up after Easter for Charity Week! After the success of the 24 Netball last year we're offering the opportunity to complete this challenge, open to all year groups! A massive well done to all of the students who took part in Southam's Got Talent! Students ranging from years 7-10 competed in the recent house competition, showcasing their talents. The show included: singing, dancing, acting and musicians.